The slot machine Jackpot 6000 is a classic slot that can be played at Oranje Casino and developed by Netent. The game is based on physical slots , as they used to be found in bars and cafeterias in the past. The game has multiple characteristics and three rows with three rows are played. 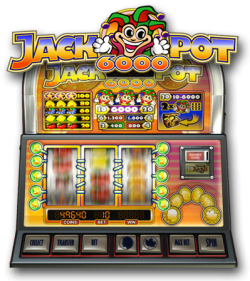 A total of five paylines are available and the game features include a basic game, a gambling game at a win and a supermeter game. In view of the high payout percentage of almost 99 percent, it is certainly interesting to take a chance on this game. The symbols on the reels include cherries, bells, symbols with a star and wild symbols. It is always possible for the player to know what the symbols in a winning combination are worth, because the prize table is listed above the reels. The maximum number of coins that can be won with a spin is 6000. That of course also refers to the name of the slot machine Jackpot 6000. The game starts with the basic game and as a player you can first decide which bet you want to play with. There are quite a few options to choose from. This makes it possible to choose with a betting option of 1, 2, 4, 6, 8 or 10. The number of paylines that become active in the game will depend on the chosen bet. Besides this choice you can also decide whether you choose to play with 0.10 euro or with 0.20 euro. If a win is made in the basic game, then the option of a gambling game is offered to the player, whereby a choice has to be made between the cup or the coin. If you win the gambling game, the player can bet again or decide to take the winnings. It is also possible to use the profit to play in the supermeter game. Playing with the maximum bet makes it possible to gamble in the game of the supermeter mode, whereby by default there is played with 20 coins and where five paylines are active. If you win in the basic game, you can click on ‘spin’ to go to the supermeter mode. If the credits in the game of the supermeter are up, you can go back to the basic game to continue playing.